The kitchen is the place where I tend to spend the most time in any given day. Whether it be cooking, baking, or restocking our cupboards, it is the place that gets the most foot traffic and probably the most use outside of our beds and couches. Having just the right tool or gadget for any kitchen job can make all the difference. It can make meal prep and cleanup easy or make it feel like a chore. I have been working with Wayfair for the past couple of years as a blogger and I find that anytime I need to replace anything in our kitchen, I automatically go to Wayfair’s website. Below are just some of the items that I have purchased from them. No affiliate links in this post – just purely showing my love for this company! I often cannot find a better deal or better quality! No kitchen is complete without a durable set of everyday glasses. These glasses stack very well in our cupboard and now I don’t have to worry about breaking our glass cups everyday. This 14 piece glass set has been one of the most used items I have in my kitchen. What I like about glass containers is that they do not stain, they clean up quickly, and do not wear out. The colored covers also help me remember what is in each container in the refrigerator. 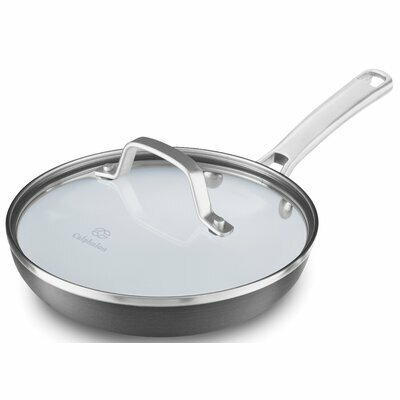 My Calphalon frying pan is something I use almost on a daily basis, whether it be for cooking up some French toast, sautéing vegetables, or making a simple grilled cheese sandwich. A non-stick pan makes for easy clean up. This ice cream scooper has made me feel like I am running an ice cream shop right out of my kitchen. This anti-freeze aluminum scooper makes any ice cream social a breeze. The ice cream really does just fall off the scooper. Fresh apple pie or apple dumplings out of the oven – nothing compares. Don’t be stuck peeling, coring, and slicing every apple by hand when you can do it all with one device. Oh, and did I mention you can make curly fries too? Stainless steel mixing bowls make cooking and baking so much easier. This 5 piece set offers just the right size for any task. I have had my set of bowls for over 10 years and would never go with any other set than stainless steel. Organize your canned goods with this easy to use food rack. I always used to lose cans in the back of the cupboard, but this tiered design organizes them all so I know exactly what I have and do not end up buying double. This 11×17 carbon steel pan makes cookie baking and dessert making that much easier with the non-stick coating. It cleans up easily and makes baking a pleasure instead of a chore. A quality set of measuring cups, that the numbers do not rub off of, is must. I like this set because it will not show any wear since it is stainless steel, but it also comes with 5 cups instead of the standard 4 piece.